Ruslan Olegovich Ponomariov (Ukrainian: Русла́н Оле́гович Пономарьо́в, Ruslan Olehovych Ponomar'ov; Roushie: Русла́н Оле́гович Пономарёв; born October 11, 1983) is a Ukrainian chess player. He wis FIDE Warld Chess Champion atween 2002 an 2004. 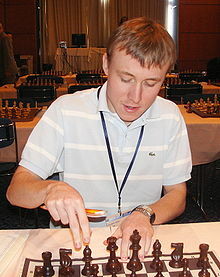 He wis a finalist in the Chess Warld Cup 2005 an Chess Warld Cup 2009, while reachin the semi-finals in 2011 an the quarterfinals in 2007. This page wis last eeditit on 9 November 2015, at 19:15.